The dog days of summer are here, and we’ve had some pretty sweltering weather lately. 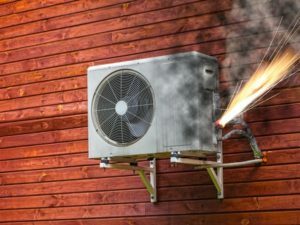 When it’s hot and your air conditioner isn’t working properly, it’s obvious that you need repair as quickly as possible. But what happens when your air conditioner breaks down in the middle of the night or on a weekend? You might already be aware that our call center is staffed 24 hours a day, 7 days a week, but when is an air conditioner problem an emergency? While we can help you determine whether you need emergency service when you call or if you can wait until regular business hours, here are a few examples of what constitutes an AC emergency. If you are experiencing any of the following problems with your air conditioning system, we recommend contacting us right away. An unusual screeching sound could indicate something relatively simple like a loose fan belt, or it could be s gin of a potentially dangerous problem like the compressor operating at a high level of pressure. If you’re hearing a strange sound that seems excessive, turn off the system immediately and contact us for AC repair. Whether you unit won’t kick on or if it kicks on but there is no air flow in your home, it could be a symptom of a major system failure. The potential causes of the problem are numerous, and without professional training, it would likely be impossible to diagnose the problem yourself. A burning odor is usually a sign of an electrical complication that has become so severe that the damaged component is actually burning. If your AC system smells like it’s burning, that definitely constitutes an emergency. Turn off the power and contact us immediately for help. When you need emergency AC repair in Hagerstown, trust the cooling experts at Larry & Sons. We’ve been serving the area for several years, and we have the knowledge and experience to tackle any air conditioning problem. For fast, dependable repair, call 301-733-5428 now.